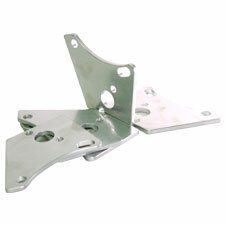 (1)Internal Wastegate Bracket will fit any T25, T3, T4 Style compressor housing. Has been redesigned many times to make it truly universal. Will also fit extra large 60-1 compressor housing. Also works on all standard GT turbos such as GT28R, GT28RS, GT2871R, GT30R, GT3071R, GT3071R-WG, GT35/40R. Very nice CNC machined piece allows virtually any standard 2 bolt actuator can to bolt up to it.